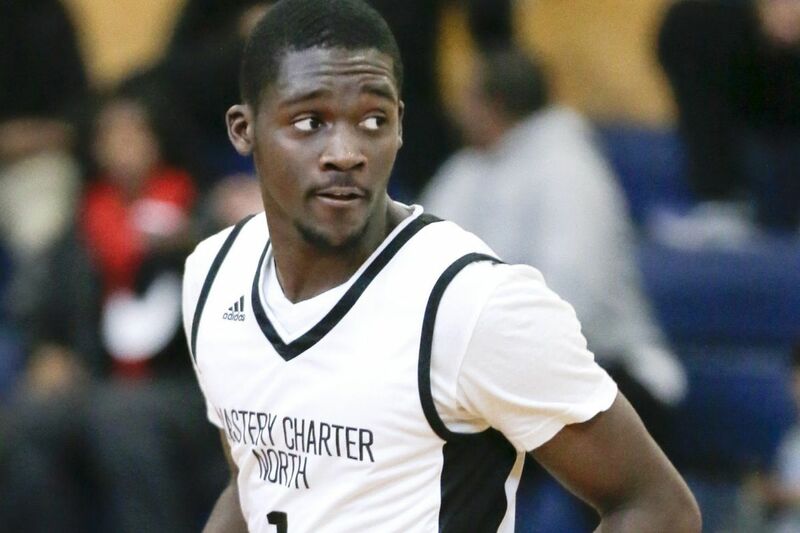 Mastery North’s Harold Daily made a big play in Saturday’s Public League quarterfinal win over Sankofa. It wasn't called "Philly Special," but a long pass from Harold Daily to Jamir Reed had a football feel Saturday afternoon in Mastery North's Public League quarterfinal win against Sankofa. The Pumas trailed by one with less than five seconds left in the first half after Sankofa turned the ball over underneath Mastery North's basket. That's when Daily and Reed made eye contact. "I was going to take the ball out," Reed said, "but our coach said [Daily] should do it. I said, 'We're going to run the Hail Mary play.' I turned and ran. He threw it. I caught it and laid it up. We looked at each other, winked and started laughing." The Pumas took that momentum into halftime, kept it in the third quarter and never looked back en route to a 71-59 victory. Daily played quarterback, among other positions, for the West Philly Panthers up until high school. Reed played until he was 9 years old for the Mt. Airy Bantams. "I just knew he was going to catch it," Daily said. "I knew if I threw it he was going to catch it. That's just the connection we have." Next up will be a game with defending Public League champ Imhotep on Tuesday at 6 p.m. at Southern, which just means Mastery North might be comfortable as the underdogs. "It ain't might," Reed said. "We are the underdogs. Nobody will have us winning, so we're just trying to go play our game. Nobody else's game. Not feed into the crowd and just upset the city." Junior forward Lakeem McAliley could help. The 6-foot-3 do-it-all scored the Pumas' first 11 points and finished with a game-high 25 on Saturday. The long-armed lefty added five rebounds, three steals a blocked shot and finished 11 of 15 from the field and 1 of 2 from behind the three-point line — part of his game that he's worked to improve. The way he plays is actually emblematic of Mastery North's team at large. No frills. Little flash and just hard work. And that combination has earned McAliley the respect of his teammates. "I really have faith in him," Reed said. "I think he's one of the best big men in the Pub. He works for everything he's got so he deserves a lot." "He's underrated," Daily added. "He doesn't talk [trash]. He doesn't do any of that. He goes out there and does his thing. I love his game. He's the best player on our team, to me." Reed finished with 17 points, 9 rebounds, 4 steals and 3 assists, while Daily added 16 points for the Pumas (18-5). Sankofa (16-8) was led by Scott Spann's 17 points and 8 rebounds, while Jiair Ballard-West added 13 points and 12 rebounds. Foul trouble forced talented forward Khalil Turner to the bench for much of the third quarter before he fouled out with about 4 minutes left. Sankofa also shot just 2 of 21 from the three-point line and was outscored in the pivotal third quarter, 17-7. MN: Lakeem McAliley 25, Jamir Reed 17, Harold Daily 16, Tahj Campbell 6, Alvin Williams 3, Kareem Hicks 2, Rodney Phillips 2. S: Scott Spann 17, Jiair Ballard-West 13, Derrius Ward 9, Khalil Turner 8, Demitri Hover-Reed 5, Jordan Fuller 2, James Savage 2, Kobe Devine 3.